Lunch at Hattiesburg’s rustic Simply TeaVine tearoom. From the left are three sisters, my cousins Judy, Wanda, and Carolyn; my sister-in-law Lila, and me. Tuesday was for me a happy reunion of the special ladies pictured above. They were among the ministering angels to my mother and me after my stroke and during the closing months of my mother’s life last year. And their presence and support offered comforting strength during my mother’s last days. 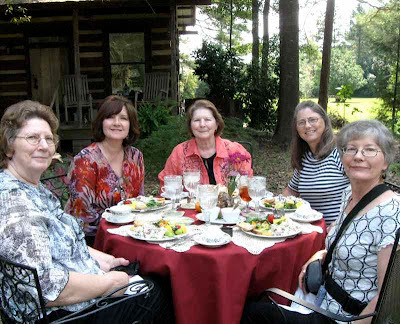 Judy, knowing that hot tea is my preferred hot beverage, alerted me to a new tearoom in Hattiesburg, the hometown of my youth. A visit to Simply TeaVine’s web site intrigued me, and a conversation with owner Dean Meador Smith started arrangements falling into place. Lila gave me possible dates that she could join us for lunch and also transport us both to the Hattiesburg destination. Carolyn coordinated with the sisters’ schedules. I made reservations and consulted with Dean about the menu. Finding the establishment was an adventure. It is tucked away on a pristine and peaceful 3.5 acres. Once we were on the property there were no clues that we were surrounded by commercial and industrial establishments along a busy highway. Another unexpected delight was that our luncheon was set up outdoors, near the family’s 1885 log cabin and the cabin’s “glorified outhouse,” a recent addition that appears vintage but contains a commercial kitchen and modern restroom and shower facilities for the cabin which is now part of Meador Homestead B and B. 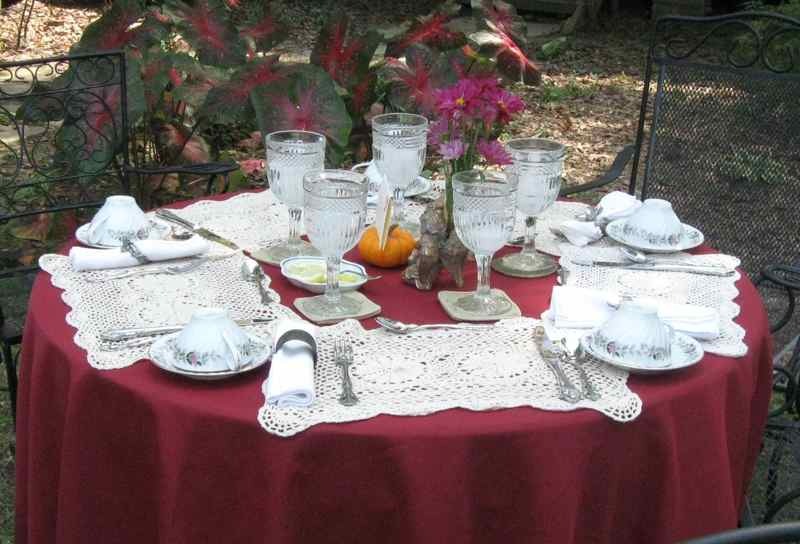 The table was beautifully prepared for our arrival, with a perfect environment of privacy, quiet, a comfortable temperature and a view of the surrounding woods, meadow, and pond. We visited the kitchen and a condensed version of the Simply TeaVine gift shop. A bit of shopping ensued. Owner Dean and friend Peggy pause in their preparations to fulfill my request for a photo with their cookbook. In addition to operating Simply TeaVine, Dean and Peggy also assembled Ms. Sippy, a cookbook of recipes featuring the tearoom’s fare. Dean’s second cookbook is set to debut soon. 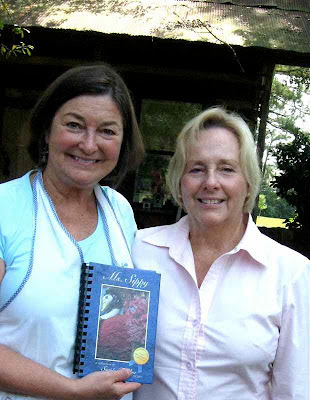 It features recipes of family and friends with the stories behind the recipes. If the descriptions of some of the teas given on their web site is any indication, the combination of history, food and tea will be a good, and tasty, read. Dean and Peggy created an atmosphere that made us feel like old acquaintances welcomed into a friendly home where hospitality is a priority. Peggy delivers a glass of iced raspberry tea. We were surrounded by the thoughtful planning of visual treats, eats and tea. Engaging cherubs display fresh flowers on a serving tray. Our selection of the two teas that accompany the luncheon became a ceremony with the arrival of our tea menus in an embroidered and embellished fabric pocket. Dean delivers our Black-Eyed Susan tea. 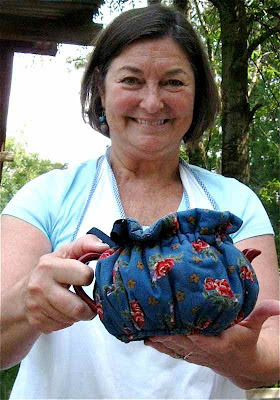 The charming tea cozy that kept the teapot and tea hot had the needle-and-thread wizards in our group wanting to examine the cozy to determine how to construct one. 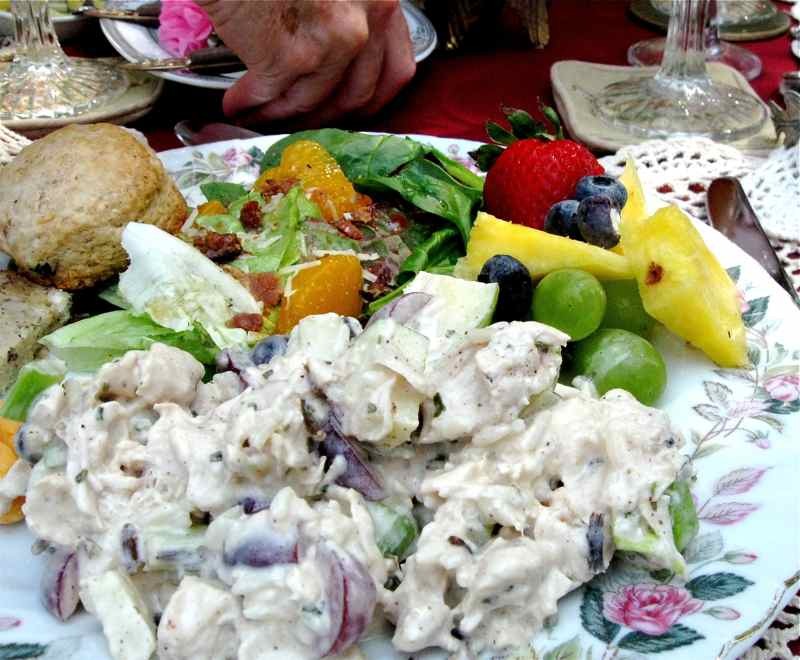 The Paradise Luncheon included Adams and E’s Paradise Chicken Salad, garden salad, fruit, scone, banana bread and Dean's Cheese Delight. We took Dean’s recommendation of apple and spice, an herbal tea, to accompany the Iron Skillet Apple Pie dessert. In the midst of my apple pie and ice cream induced ecstasy, I forgot to take a photo. Even though I traveled back home carrying about two additional pounds, it was a simply “teavine” day. And I am a sucker for puns. 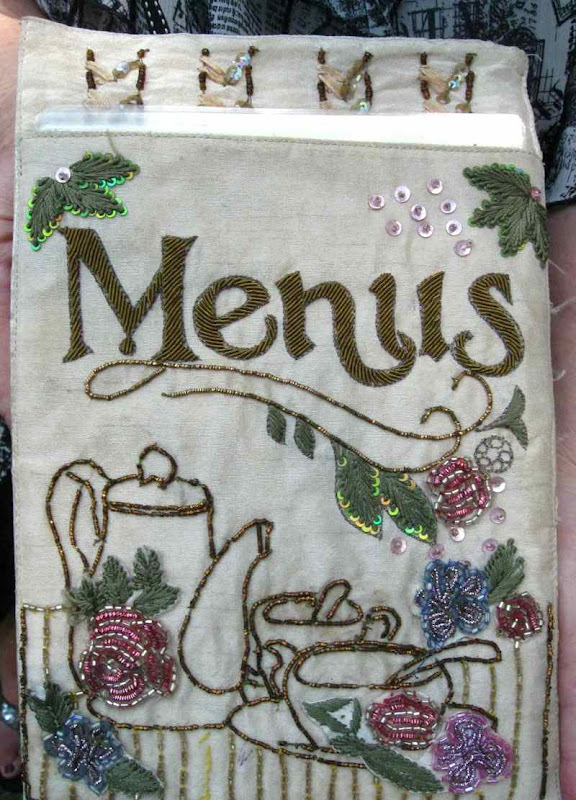 For me the tearoom’s word play on “simply divine” was lagniappe. Oh LC, what a beautiful memory you've made with old friends and new. What a delightful place to have lunch with your family/friends! I'm so glad you shared your adventure with us. 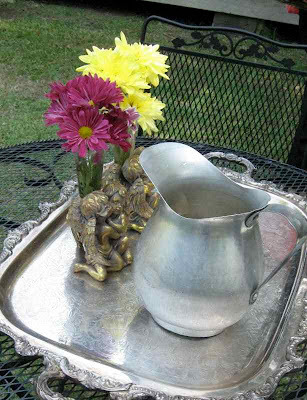 The silver pitcher pictured brought back good memories of my past. I haven't seen one of those since my childhood days at grandma's house! Speaking of childhood memories, I really enjoyed your comment about your mother's making of the toast. Mama always made toast in the oven, too, and I haven't thought about it in so many years. my eyes went right past the beautiful table and people around said table to that old log cabin. i have a passion for old log cabins, not the new bigger better cabins but the ones like this one. a wonderful place to be outside. This looks like THE perfect place for lunch and tea. Everything looks like it has been done to perfection. I'm glad you could meet with your special friends there. Thanks for sharing your wonderful time with family and friends. 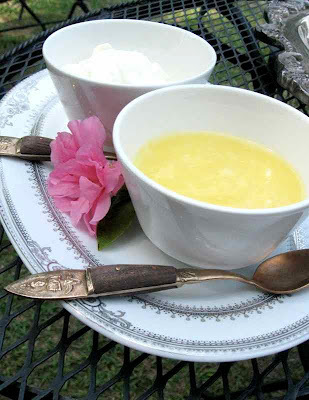 I can almosst taste the clotted cream and lemon curd. I had to laugh at the memory of my son sending me a gift of scone mix, with the accompanying condiments on Christmas. The clotted cream was missing. Perhaps he did not think I would miss it? You have given me great ideas for my next party!!! I just love the bright colors on your plate and the concept of the iced fruit tea. I love iced drinks! I definitely would have had a wonderful time at that rustic restaurant. What a divine place to have your get together. I love the name and it definitely is lagniappe. Hubby and I always wanted a tea and coffee house/antique place or a Bed and Breakfast with lots of antique do-dads around. Unfortunately that is not going to happen but we are drawn to that atmosphere. Some dreams must stay dreams.